Ducky 1 is a fully equipped vacation home. We think it's 'Just Ducky'. We prefer Saturday to Saturday reservations during our winter season, but will consider off days if open. IF BOOKED AS ABOUT OUR OTHER HOMES. We have several homes in the same area, so let us know your dates, we may be able to refer you to another of our great properties. As the owners, Ron & Kathy, we manage our own home. We live near by, and strive to provide an excellent vacation experience for all of our guests, some who have been staying with us for over 15 years. Need some suggestions for places to eat, to shop, to take the kids etc. Just ask us, Kathy grew up in Naples, and we are happy to share our knowledge of the area. We provide Cable TV, Wireless Internet at NO charge. 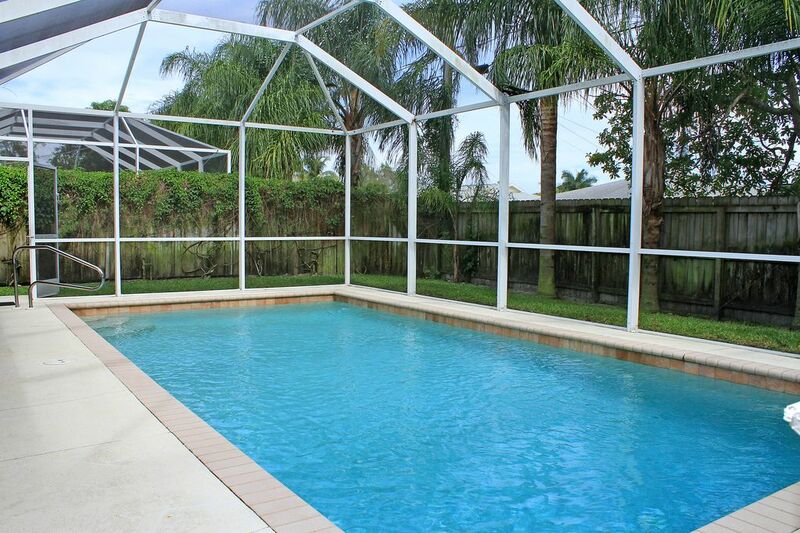 Enjoy the enclosed heated in-ground pool (south-facing pool). Take a short walk or bike to the white sands of Vanderbilt Beach. (included minimum of 2 bikes). We also include a pass to the state park on the beach, so you can drive, take our cooler, umbrella, chairs etc.and park for free at the beach. Ducky I is beautifully furnished 4 bedroom, 2 bath home with great room. (sleeps 7 to 8). Bring the family. We include a crib, pack and play, a highchair and pool toys!. Add sunshine to make your beach days just about perfect. Like to play GOLF, we have clubs available, just request them when booking, and save the extra charges at the airport or golf course! ! Our Guest Book will guide you to the grocery, shopping, and a few of our favorite restaurants. As owners we are the on-site managers. We will check in on you after your arrival to make sure you have everything you need for your vacation. Amenities:: Ducky 1 is fully equipped with everything you need for a perfect vacation. Heated and enclosed pool, great room Cable TV, master bedroom with cable TV. We have tried to anticipate your needs in the kitchen, at the pool and yes even things you will need for the beach. Also includes Climate Control Air-Conditioning, Gas BBQ grill, washer/dryer, dishwasher, telephone, microwave, toaster, coffeemaker/grinder, dishes/utensils provided, hair dryer, linens & towels provided. Also includes two to four bicycles, Pack & Play, and high chairs available. For the vacationer that loves the beach there are Delnor-Wiggins State Park Pass for entry & parking at beach. No Pets or Smoking. Just minutes to the Ritz Carlton, and many excellent dining opportunities in all price ranges. There is Golf & Tennis nearby, Nature Preserves, State Park, Fishing, Boat Charters and Rentals, Sunset Cruise to the Gulf of Mexico, Movies, Bike Rentals, Shopping, Dining, Water Sport Rentals at the Beach, Theater, Special Events and Sporting Events at Hertz Arena, Teddy Bear Museum, Children's Museum, Zoo at Caribbean Gardens, The Revs Institute an Antique Race Car Museum etc. Just South of us is Fifth Avenue. Just North of us is Miromar Outlets, Coconut Point Mall. Just minutes away you can visit the Art Museum or take in a show at the Philharmonic Center for the Arts. Nestled between the calm waters of the Gulf and the excitement of the Everglades, nature lovers can enjoy nature and explore the excitement of the Everglades by boat. Many fishermen come to Naples. Water sports enthusiasts find all kinds of exciting action along the coastline. Golfers know there are over 200 exciting golf courses in Collier County. Naples has great golf. I grew up in Naples and attended St Ann's grade school and Naples High School. Go Eagles! I then went to College in Ft Myers and The University of Florida. While at College, I met my husband, Ron. We were married in Naples, and he did a tour in Viet Nam. I taught school in Naples and in Ft Lauderdale, then we returned to Bloomington IN. I taught briefly in IN, and then managed rental property for IU students. There I learned to say Go Hoosiers ! I am still a Gator at heart. Ron worked in development and in Real Estate as well as managing our rental property. We sold our rentals in Indiana, and decided to invest in Vacation Homes in Naples, so we could return to Naples where we both loved the beach, golf, fishing, and the weather. Here we have reconnected with family and friends from long ago. We also have enjoyed meeting our guests from all over the world. We love our Midwest guests, but we also love becoming friends with guests from other parts of the US, Europe, Canada, and South America. We feel very fortunate and blessed to be in a wonderful climate and city, doing work we enjoy, and making new friends along the way. Naples is known for being the Happiest and healthiest City in the US. Looking for a home to call yours, just ask Ron. He is my favorite Real Estate Broker, and he has a tremendous knowledge of the area. We love the location, close to Vanderbilt Beach, the Ritz Carlton and LaPlaya, Mercato and many shops and dining opportunities. We are just about 9 miles south of Miomar Outlets and Coconut Pointe Mall. We are just about 9 miles north of Fifth Avenue and Third Street shops and dining. We are close to Trader Joe's, Grocery stores, and shops. We are less than a mile to Mercato. It is one of our favorite spots to dine. The Happy Hours are wonderful. The desserts at Whole Foods are creative and delicious. Many people enjoy the shops and the activities like car shows, movies and live music. There is something for everyone at Mercato. We are so close to everything Naples has to offer, but the close proximity to the beach and Delnor-Wiggins Pass State Park on the beach is a unique advantage for us in Naples Park and Vanderbilt Beach area. Naples Park is becoming a Beach Community as smaller homes are replaced by lovely new homes. Come and see why we love it here. Shopping abounds. Mercato is the New Uptown about a mile away. To our North about 15 minutes away is Coconut Pointe Mall and 25 minutes is Miomar Outlets. To our south just 5 minutes away is Waterside Shops. Fifth Ave. and Third Street are just about 15 minutes to our south. Many Restaurants at all the shopping areas. All Sheets, Bath Towels, and Beach Towels Provided. 2 Car Garage and driveway that can fit up to 4 cars. Bath Towels, and Beach Towels Provided. Side by Side Stainless Steel Refrigerator. Water and Ice in the door. We are self-Catering. To reduce stress upon arrival we provide a start of spices and coffee filters for your use as well as soaps and paper goods. Please replace as needed. 2 complete sets of dishes. Each set has place setting for 8. All other items also provided in the kitchen. Items not listed may be available upon request, such as Lobster Pot, Crock Pot etc. Large Family table for Lunch or Dinner. Previous guests have left an extensive library of books. Pool and Beach toys are included. Lanai with covered area for dining and area around the pool with lounge chairs for sunning. All under screen enclosure. Private in ground pool. Heated and screened. We are self-catering. We do welcome our guests with a small starter supply of soft soap, dishwasher soap, laundry soap, toilet paper, and paper towels etc. Betsy was able to go to the beach 3 times and of course I got sunburned the first trip to the beach. We found great restaurants Oceanside and had a great day to shop in Naples. Lunch at the red umbrella place. Our trip was just too short with flying in and out of porta Gorda and taking out daughter to the airport!. Very clean, well-supplied, easy drive to everything. We had a great time here. The house had everything we needed and more in the kitchen for cooking and serving food, extra blankets, pillows, beach toys, strollers, bikes, pool toys. The beach pass was a huge plus. The beds were super comfortable. Appliances were top notch. The house was the cleanest we've ever stayed in. The neighborhood was safe and quiet. The owners were attentive. The bathrooms were well stocked. Had lots of starter things like soap, shampoo, dishwasher detergent, etc, which was really great. We came in January the weather was 80 and sunny every day and pool water was heated perfectly. Highly recommend. So glad you were able to enjoy our home with your family. It is also nice to know our efforts to make your vacation stay stress-free and comfortable are appreciated. Thank you for taking the time to write a review. We appreciate all our guests. The house was in great shape and in a good location. Kathy was great to work with. Ducky 2 was just Ducky! We were quackers about the place! The house had everything we needed: bikes, golf clubs, beach toys, iron and board, outside grill and more. It was a pleasant one mile walk or drive to Wiggins State Park and a park pass is included with the house. Unfortunately, a red tide occurred while we were there so the beautiful, screened pool was our favorite place to hang out. Kathy let us know she was nearby if we needed anything, but left us alone during our stay. If we ever go back to Naples, Ducky 2 would be our first choice. It felt like home away from home! Thanks, so glad you enjoyed our home. We would love to have you back as our guest. Loved your review. It just quacked me up ! We had a wonderful week staying at the Ducky home! The house was very comfortable and well equipped with everything we needed for a fun filled week! The owners were very kind, respectful and great communicators. The location was terrific as well!! Thanks for taking the time to write a review. We are so glad we were able to help make your vacation stay in Naples enjoyable and fun. We look forward to having you as our guest again. Myself, wife and 4 year old twins decided to come up to Naples week of Xmas (Dec 2017) and had an amazing week at Ducky 2. Kathy was extremely responsive with all relevant details and with questions we had before, during and after the visit. We decided to cook and grill in the kitchen/ outdoor grill quite a bit during the week and the well stocked variety of tableware, pots / pans and utensils was very much appreciated. The heated pool was outstanding - we probably spent a good 2-3 hours in the pool daily and the kids loved it. There are a variety of kids activities nearby such as the beautiful nearby beach, naples zoo and childrens museum. We found the North Naples area to be perfect - many nearby stores / supermarkets and restaurants and close to the beach. We also took the Trolley tour which you can pick up from the nearby Mercato shopping center to the downtown area. Home itself is very clean, cozy and peaceful. All the previous reviews were right on the money - you won't go wrong staying here! The only depressing part was having to leave on the last day! We're definitely planning to come back when we get another break! Naples is one of the worlds premier beach destinations in Florida. Naples is not far from Disney World. This makes Naples a favorite vacation stop for family's who also visit Disney World, the Happiest Place on Earth. Golf Courses, Tennis facilities, Nature Preserves, a 25 Acre Water Park, Kayaking, Canoeing, Sailing and Water Sports all appeal to families. Explore the Everglades, take an air boat ride, do some fishing or just enjoy the white sands of Vanderbilt Beach, and your own private pool at your vacation home. Located in Vanderbilt Beach area near the famous Ritz Carlton, LaPlaya, the Turtle Club and Mercato makes this vacation home close to everything. Other Activities: Water Park, Tennis, Boat Ramps, State Parks, Kayaking, Canoeing, Wind Surfing, Walking, Biking, and Lots and Lots of Shopping ! Golf: Over 100 golf courses located within 20 to 30 minutes of the vacation home. Our guest book in the home will provide phone numbers of many of them for your convenience. Call Kathy 812-327-8950 $300 Deposit is due with the reservation. One half is then due half way to rental date. The other half is due 2 to 3 weeks before arrival. $175 Cleaning Fee. (tax included on cleaning) Cleaning Fee is deducted from the deposit after your stay. 11% Florida Tax on Rent is additional. Accept Visa, MasterCard and Discover over the phone. Rates Subject to Change without notice. January and August are our best value seasons. If booked, call for availability in our other homes. CALL for discounts 812-327-8950. Ask about our welcome gift !